Box is a popular cloud storage service you can use on the iPad for work purposes that recently added its own note-taking feature, storing its notes with all your other documents on Box. To use Notes for Box, you have to have a live Internet connection — the notes are created and stored on Box’s servers, not on your iPad. In the Box app, open the side menu by tapping the icon of a ¬ in a box at the upper right of the screen. Then tap the + icon at the top of that menu. Now tap Create New Box Note, and wait a few seconds for the tool to load. What you get is a very simple note-taking tool that has minimal formatting features: There are buttons to create bulleted, checkmarked, and numbered lists, and to indent and outdent paragraphs. That’s it. 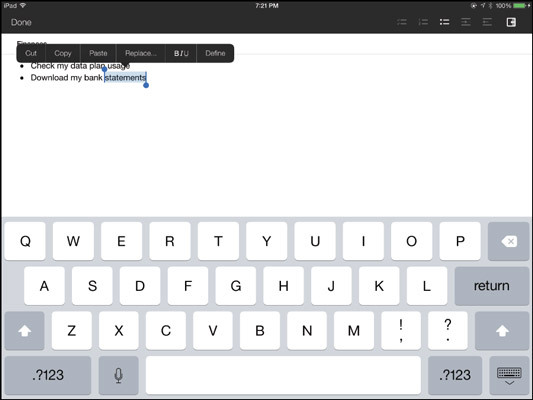 You can use formatting such as boldface, italics, and underlines by selecting text and using the standard iPad text menu’s BIU menu option. That’s it! Notes consist of a title and the note text. No more. In the note’s side menu, you have options to copy, move, rename, and delete the file. Your notes appear in the Box file list with your other documents. You may not see Box notes in your Box Sync folder on your computer. If not, you can see (and edit) them in your browser after signing into your Box account at the Box website.